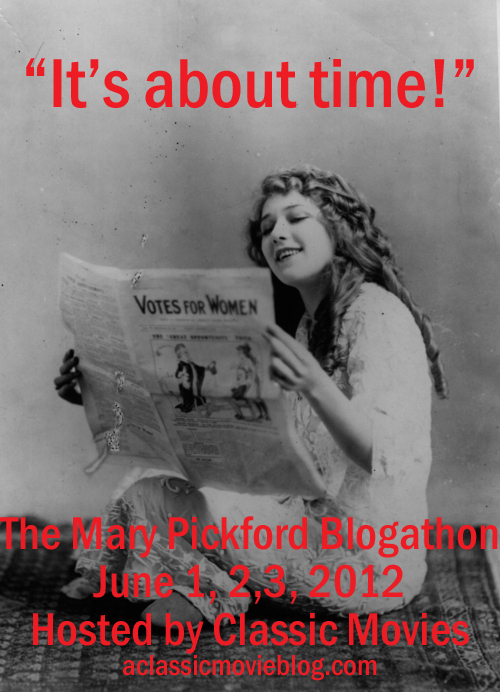 A Classic Movie Blog: The Mary Pickford Blogathon: It's Here! This screening was part of a great silent movie series in my city. I was pretty sure this was the first time they had shown a Pickford movie. About five minutes into Sparrows, I wondered what had taken them so long. It helped that I was watching the film in a gorgeous theater with an enthusiastic audience and the accompaniment of a first rate organist, but that was clearly the icing. Pickford charmed the audience immediately. I'd never seen such a giddy reaction to a film performance. You could see the glow of teeth in the dark. We couldn't stop smiling at her! Maybe some of the crowd walked in there with the same misconceptions about Mary I had. I'd been almost reluctant to see the film, because photos I'd seen of Pickford in curls and Mary Janes had convinced me that she was too old-fashioned for even a devoted classic movie geek like me. Pickford had a remarkable ability to transmit her thoughts in a crisp, direct fashion. There was no set method to it; she just used her common sense. When she thinks she's in trouble, when she's delighted or, my favorite, when she's getting pissed off at some rotten bully, you can see it coming on as if she's telegraphed the message to your mind. A lot of that skill came from observing human behavior. Pickford was particularly clever in the way that she used her study of children to play her famous little girl roles. With precise body language, from the way she held her jaw to the bounce of her walk, she could believably play young girls into her thirties. It took much more than short stature and a youthful appearance to be able to do that well. As Mary plowed her way through the virgin territory of the movie industry, she was first in so many ways that you get weary of keeping track. I think this has hurt her legacy as an actress. Constant reference to her accomplishments has drawn attention away from her genius for creating riveting performances that were pure cinema. It's easy to be astonished by all she has accomplished, but sometimes you need to set all that aside and just pay attention to the woman on the screen. What I love about the participants of this blogathon is that you all do get what's wonderful about Mary Pickford and I sense that you want others to discover her too. Thanks to all of you for helping to bring attention and admiration to this remarkable woman. I hope you all will enjoy the posts and leave lots of comments for this talented group of writers. Enter the Book Giveaway Contest! As many of you know by now, author David Menefee has generously donated an signed copy of Sweet Memories for the blogathon. The book is an entertaining fictional retelling of Pickford's early life and career as envisioned by her mother Charlotte. If you would like to enter, all you need to do is tell me one thing you like about Mary Pickford in the comments. It can be something you like about her personally, something she once said, a film or even a moment from a film. I will put all entries into a stylish toddler sunhat and draw a winner on the last day of the blogathon. And now on to the posts. Happy reading! My special guest today is author and filmmaker Sarah Baker, who has written a fascinating post about Jack Pickford's first wife Olive Thomas and the tragic star's relationship with Mary. David W. Menefee, Why Do People Love Mary Pickford? Belligerently I Marched. . .
My special guest today is author and Pickford biographer Peggy Dymond Leavey. In a fascinating Q&A, she shares her thoughts on Pickford and the process of researching and writing her book, Mary Pickford: Canada's Silent Siren, America's Sweetheart. The Most Beautiful Fraud in the World, Mary Pickford! America's Freakin' Sweetheart! A Twitter entry! From Chris Giddens, @chrisgiddens, Jollification: Heart o' the Seagulls [Mary Pickford] Aside from being really cute, and the reason for my most recent big smile of the day, this video beautifully demonstrates why developing a strong soundtrack is such an important part of restoring silent films. This scene plays so differently with a modern soundtrack! Don't forget to enter the book giveaway! Just tell me one thing you like about Mary in the comments. Got it! Thanks Hollywood Revue. Sparrows really is one of her best -- a great one to start with. Lucky you! “Mary Pickford can be a doll, a village belle, or a church angel. Her powers as a doll are hinted at in the title of the production: SUCH A LITTLE QUEEN. I remember her when she was a village belle in that film that came out before producers or actors were known by name. It was sugar-sweet. It was called WHAT THE DAISY SAID. If these productions had conformed to their titles sincerely, with the highest photoplay art we would have had two more examples for this chapter. Mary could be cast as a cloudy Olympian or a church angel if her managers wanted her to be such. She herself was transfigured in THE DAWN OF TOMORROW, but the film-version of that play was merely a well mounted melodrama. Why do the people love Mary? Because of a certain aspect of her face in her highest mood. Botticelli painted her portrait many centuries ago when by some necromancy she appeared to him in this phase of herself. There is in the Chicago Art Institute at the top of the stairs on the north wall a noble copy of a fresco by that painter, the copy by Mrs. MacMonnies. It is very near the Winged Victory of Samothrace. In the picture the muses sit enthroned. The loveliest of them all is a startling replica of Mary. Thank you for your entry. When I was first curious about Mary Pickford, I saw some of her still photographs with her in curls smiling wearing a little girly dress and I figured she looked too sweet and innocent for me so I didn't try to seek any of her films until some film buff recommended her to me. When I saw her in Daddy Long Legs,her facial expressions and physical comedy were outstanding and after the film was over, I was thinking wow that was possibly the one most enjoyable actresses I ever watched! 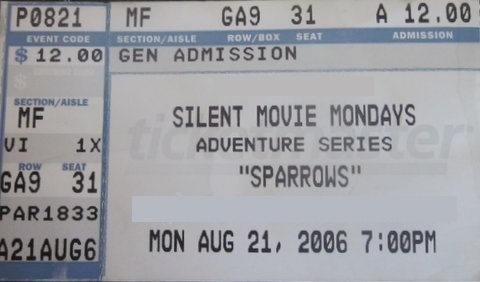 I didn't get a chance to see Sparrows until it premiered on TCM in 2011 at like 2:15AM Pacific Time. I actually stayed up that late to watch it "live" and DVR it at the same time. Hopefully someday I'll get to see a beautiful screening of it here in LA. And, to be in the contest having a chance to win the book: I like many stuf about Mary Pickford, like she being a pioneer in movie industry, but what I like the most is that she had exactly the same height as me: five feet and half an inch. Monkey--I know; now that I've seen her other movies, I do realize what a remarkable start Sparrow was. It's still one of my favorite movies. David--I love the way you have woven your research into this post. I need to get a copy of that Lindsay book. 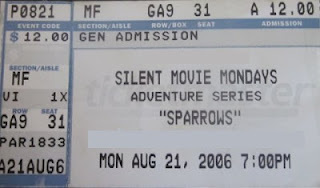 Melissa--I really hope you get to see Sparrows on a big screen some day. The photography is so beautiful and the bizarre combination of comedy, thrills and tragedy is incredibly intense with a live audience. I'm afraid most of us got the wrong idea seeing those pictures of Mary dressed up as a little girl! But then, that's essentially what I'm trying to change, at least a little bit, with this event. Lê and 11east14street--Thank you both! I am delighted you could contribute. I'll put these in day 2 so I can be sure the early readers catch them. I love your reason for loving Mary Lê. I didn't realize she was a 1/2 inch over 5 feet--hehe. Wonderful Manon. I've been looking forward to reading this. Thanks! A look at A ROMANCE OF THE REDWOODS. I lucked into an eight-film Mary Pickford series at a repertory theater when I was living in Chicago about 15 years ago. That was when I first saw the three titles that are now my favorites among her films, "My Best Girl", "Tess of the Storm Country", and "Daddy Long Legs". Before then I had only seen her in "Little Lord Fauntleroy", a story I've never much liked in any of its versions. It amazes me now to think that I wasn't excited about the series and only started going because it was a chance to see silents in the theater with live accompaniment. At the end of the series she was one of my favorite silent stars! What I most love about her is that she's so wonderfully expressive. Many thanks to the excellent, engrossing blogs posted on the Blogathon! In case some readers have missed viewing a title or two, here are some easy links to some of Mary Pickford's feature films that are available for viewing anytime for free on the Internet Archive. (The site also features a number of her earlier one-reel films, too!) Some are with, some are without scores. The first item on the list is the long CBC audio interview recorded by Mary, in which she discusses most of her life and career. 8 films! That's a great stroke of luck Helen! I can't believe how many of us came to like Mary the same way--first skepticism, then total adoration. David--thank you for sharing these links. Yes, the "Pickford Fairy" has made a recent trip to the Internet Archive. Now we've all got a chance to check out lots of rare Pickford films! I have heard that most of these don't have scores in order to respect copyright laws. I've noticed that Chopin waltzes work with a lot of the dramas! Making my way through each and every blog! My introduction to Mary Pickford was the exhibition and films screened by TIFF (see the blog from Pretty Clever Films). "Through the Back Door" 1921 was a treat, but then "My Best Girl" came on the big screen. Such a wonderful romantic comedy, it's become one of my favourite films, silent or new fangled talkie! I now have the DVD which I'm happy to share and make new fans for Mary and Buddy! It was so close to done yesterday, then BLAMMO. Technical problems of the Blogger-created variety. But now my post is rendered in lovingly hand-crafted HTML, which I'm sure makes all the difference. Thanks for hosting! I just read the Q&A with Leavey, who was the source for some of my research. Great stuff! This is a terrific blogathon, KC. Thanks Stacia! Secrets is definitely the perfect way to end the blogathon. I haven't seen this one, so I'm particularly curious to read the post. Almost missed you Brandie. Thanks for the post. I love The Poor Little Rich Girl so much. It seems to get funnier every time I see it. Miss McCrocodile--I still need to watch "Through the Back Door." I want to check out that brush skating scene. "My Best Girl" is one of my favorites too. I love how she branched out and did a sort of Clara Bow-ish role, but made it her own. I think she could have gone on to be a great eccentric matron in screwball comedies. Imagine how she would have been in "My Man Godfrey" as Lombard's mother! I LOVE Mary. I don't know why I'm drawn to her, nor will I probably ever. But I do. And my adoration of Mary Pickford (and silents in general) has the tendency to make my friends be a little weirded out sometimes. You see, I'm 12. I discovered silents through Mrs. Pickford, actually. It's only been 3 years ago, in fact. On a night when I was staying up a little later than I should have, when I flipped to TCM. The movie was "The Poor Little Rich Girl" from 1917. I was enthralled. From then on, my quest has been to immerse myself in silents and classic film in general. So, thanks to Mary for my newfound love of silents. So good to hear from you Luke. I was about your age when I started to love the classics. My friends are still a little weirded out by my love of old movies (as they were back in the day), but I don't care anymore because I meet such nice movie fans through this blog. I wish I would have discovered Mary as early as you!